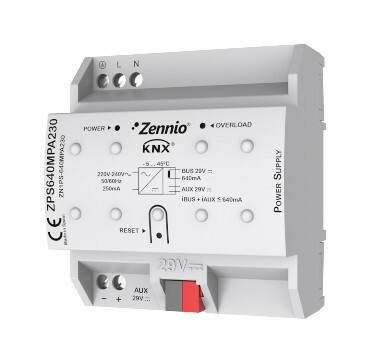 KNX System Power Supply with additional 29VDC output. Maximum current 640mA (KNX bus plus additional output consumption). Reset button and overload status LED, shortcircuit and overload protection. 230V~ 50/60Hz input voltage. Size: 80 x 90 x 60 mm (4.5 DIN rail units).